10W Thin Film Amorphous Flexible Solar Panels is portable and easy-to-use. They are known for being lightweight and incredibly durable. Many can be rolled up, which allows for them to be conveniently taken on vacations and camping trips. You may even prefer to simply take them along for your daily commute. The wide selection of sizes and output levels make these panels suitable for a variety of purposes. Another great benefit is that a flexible solar panel does not need to be used on a flat surface. It can be placed on curved or uneven surfaces which, in the past, would have made it difficult for a rigid panel to function properly. A flexible solar panel is capable of powering a variety of things. They are commonly used to charge standard batteries and electronics, even car and boat batteries. The flexible surface also allows for these panels to be incorporated into such things as backpack and tent designs. 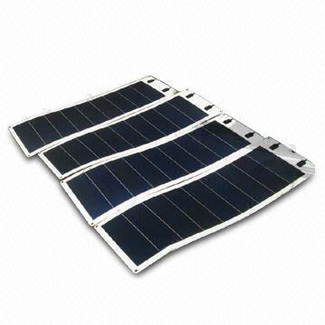 1) The flexible solar modules can not be bended excessively and randomly. 2) During the transportation, installation, application and maintenance, it is forbidden to step and put heavy pressure and scratch on the surface of the module with blunt instrument.